Are you traveling to Africa, South America or some other out-of-country destination for your upcoming hunt? If so "SCI's Blue Bag Program" may be right for you. This humanitarian program operates on a simple premise. When traveling you generally take less luggage than the airlines allow; so why not take an extra bag; an "SCI Blue Bag". Tell us where and when you are going. The chapter will help in filling the "Blue Bag" with school supplies, clothing, etc. which are so desperately needed within the region to which you will be traveling. We will make arrangement for you to meet the recipients at a convenient location where you will be rewarded with their smiles and joy by receiving the supplies. All we request is pictures of the event and the return of the "Blue Bag" for use by others. 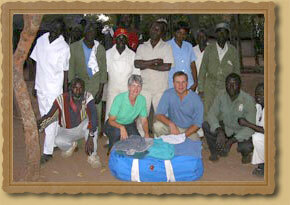 Last year, "SCI Blue Bag Program" shipped nearly 26 tons of needed materials to third world nations. Make a difference when you hunt and support the "SCI Blue Bag Program". the world to deliver our Blue Bags. Our good friends Erin and Mike Gate owners of Sunset Cove Resort along with the students from Nestor Falls School share their SCIF Blue Bag Experiance.